Effacez définitivement les données du disque dur ou du support de stockage. 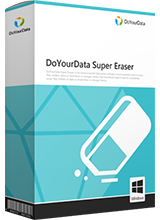 L'offre gratuite du jour pour DoYourData Super Eraser 5.5 (Windows and Mac) était valable le 22 décembre 2018! DoYourData Super Eraser offre une solution d'effacement sécurisé des données pour effacer définitivement les données du disque dur ou du support de stockage. Il vous permet d'effacer des fichiers / dossiers, essuyer tout le disque dur / périphérique. Il peut également d'effacer l'espace disque inutilisé pour effacer définitivement les données supprimées / perdues sur le disque dur. I've never seen a purpose for this type of software. If I want to toss out anything with a HDD, I take out the drive and destroy it. If I want to sell or give away anything with a HDD, I format it and re-install OS. jj juice, if you give or sell me your old computer, with a formatted drive and re-installed OS, I can recover almost all your old data with any of the many giveaways we have seen here. Or with the free Recuva. Formatted does NOT wipe the original data. It only 'tells' your computer it can overwrite all existing data. jj juice, if you give or sell me your old computer, with a formatted drive and re-installed OS, I can recover almost all your old data with any of the many giveaways we have seen here. Or with the free Recuva. Formatted does NOT wipe the original data. It only 'tells' your computer it can overwrite all existing data. little ricky, When files are deleted from your computer/disk formatted, you are simply deleting the directory listing for the particular file. Even thou it is no longer "visible", the data remains on the disk and isn't permanently removed until it's overwritten with new data. Just re-installing an OS only over writes the area previously used by the OS. Other data remains. The only real way to actually wipe a drive so nothing can be recovered is a complete overwrite of the complete drive, usually consisting of all zeros, except the 511th and 512th byte..those are left with the code that allows the BIOS of an MBR system to recognize the drive is ok to write to. Or take a hammer and nail to it and completely destroy the platters inside. little ricky, you might de amazed. I remember long, long ago I used to replace the two bytes in the header of an encrypted WordPerfect file to make unwanted de-encryption more difficult. little ricky, you might de amazed. Many formats, like .pdf and .doc have a characteristic header that can be found. And from there ... I remember long, long ago I used to replace the two bytes in the header of an encrypted WordPerfect file to make unwanted de-encryption more difficult. Can it be installed on a flash drive for portable use? I want to be able to run it from a plug-in flashdrive to erase the hard drive of the computer that it is plugged into. Can it be installed on a flash drive for portable use? I want to be able to run it from a plug-in flashdrive to erase the hard drive of the computer that it is plugged into. Please let us know. It sometimes makes sense to run an app from a bootable USB drive, e.g. today's GOTD, DoYourData Super Eraser, but it seems like most often the app in question is not portable, often because of where it stores activation data. One potential solution is to create a Windows To Go USB drive, which is really just a copy of win10 plus the files needed for it to boot. You can create one using rufus & a win10 ISO -- Enterprise & I *think* Edu versions won't try to activate if that matters to you -- win10 will for the most part run fine unactivated. And since it's a regular copy of Windows, you can install & activate software like DoYourData Super Eraser. Control image and video files encryption. Explore rock climbing at Joshua Tree National Park . Memorize French words and increase language skills. Change the clock design to DOS-inspired visuals.